Searching in this box will retrieve only eBooks held by Portland State University. Please note: if you do another search within the catalog, it will default to all format types. 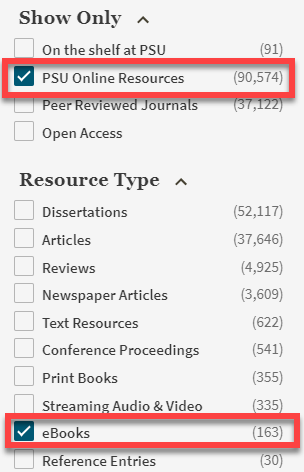 Search with title, author, or keywords in the search box on the PSU Library homepage. Under the limits, under Availability, select PSU Online Resources, and under Resource Type select eBooks. For the eBook you select, click Online Access, then the link provided after "available online at.."
*Tip: There are different rules for different collections. Check out the eBook Features tab for details.